It was so convincing, yet I knew it was not true. I was going to wake up and it would still be there. A POOR night with wild and aggravating dreams again, caused no doubt by the constant ingestion of painkillers every two hours. My weight is down by twenty-nine pounds since October. Not good enough. Reading old diaries yesterday, I see that in 1988 I went running in Mayfair most mornings and clocked around twenty pounds less than now. I am told that The Guardian ran an article by one Nick Cohen a few days ago carelessly slagging me off as "one of Europe's leading neo-Nazis." I suppose that the Cohens of this world need such fictitious opponents. I idly wonder what the qualifications of a leading neo-Nazi are? I wonder what the bewigged gentlemen in QB.VII in the Strand would consider the qualifications for that smear to be? I am reminded of a famous TV interview in Canada. The foolish female interviewer asked my friend Ernst Zündel to justify selling "neo-Nazi marching music" from his bookstore in Toronto. Zündel indignantly interrupted: "They're not neo-Nazi marches." Foolish Female: "Then what would you call them?" Wish I could have seen that girl's face. OUR search engine generates a handy automatic report on what keywords people have been looking for on my website each week. Guess who comes out top? Who is "obsessing" now? Of course, it might just be the attorney who is searching. Na, prost! OUCH. This morning I have definitely put something out, while struggling unaided to get dressed -- suddenly anything but easy, since the surgery. I felt something on my right side "go." It now feels uncomfortable, to say the least, and since nobody is looking I lie down for half an hour. 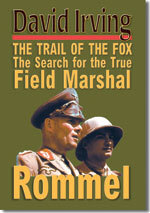 Then back to work, tweaking the new hardback Rommel jacket, and I finally upload a TIFF version at one p.m. THE MUSCLE on the outer side of my thigh is badly swollen, causing a major, major, major problem this morning and I feel quite nauseous. It can't be the titanium: titanium has no nerves. My name is Michael D. Loede and I was at your speaking engagement a few years back in Cleveland, Ohio. My ex-wife has destroyed the autographed book I purchased from you as well as the beautiful poster I bought as well. She has reported during our divorce that I am a "Nazi" and "white supremacist" and that I support "neo-Nazi groups". Obvious to make me look bad in court. My question sir is do you plan any future engagements in Northeast Ohio any time soon? 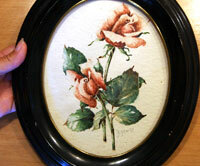 I would love to re-purchase the Dresden book and poster that my ex has destroyed. I shall speak in Ohio during May I think. . . Sorry to hear of the lawyer problem. I can tell you that several divorce lawyers in Ohio have used precisely the same ugly tactic. Against E. --, for example. More often than not the "Southern Poverty Law Center" run by multi-millionaire lawyer Morris Dees, an ex-Communist Jew and his fellow-Jew Mark Potok, is behind the opposing divorce lawyer. Dees invariably seeks Discovery of all possible documents, no matter how remote they are from the matrimonial issues. That's how they do it. AS I have remarked before, one of the unintended advantages of being smeared as a "neo Nazi" is that folks with genuine WW2 stuff often approach me first for a view. Nobody trusts the conformist historians: they are part of a sordid little freemasonry, vowed to varnish over the nastier side of real history. In today's mail comes a series of three or four messages conveying one of the earliest and most precious documents of the Nazi Party, a list naming what I would call the Dragon's Teeth of the movement -- the first hundred or so Germans who fell in behind Hitler. The first membership list of Adolf Hitler's German Workers Party, shortly to become the National Socialist German Workers' Party. It is only four pages long, but hands might well tremble as they unfold the sheets. 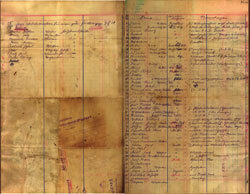 This is a document which will fetch a hundred thousand dollars or more if it goes on the auction block. It is the very essence of unique. The present owner also lives in Ohio. He says: "I'm not sure of its importance or significance. . . It was taken from Hitler's desk in one of his offices by an American soldier in 1945 after Germany surrendered. I also have pictures of the soldier and his batallion outside the buildings and a book of painting prints by the artist Corot." Screw Corot, it is the list which fascinates, evidently a handwritten ledger of the first members of the DAP party, with Anton Drexler appearing as Number 2, and Adolf Hitler as Number 7 ("member since End of March 1919," amended to "August 1919"). The columns are headed Name | Profession | Member since when | Comments. There is no doubt as to the credentials of this piece of paper: it bears the rubber stamp of Rudolf Schüssler (1893-1974), who joined the Party in December 1919 and was its "principal business manager" until July 1921. Schüssler is known to have drawn up the first membership list of the NSDAP on February 2, 1920 (cf. Anton Joachimsthaler: Hitlers Weg begann in München 1913 - 1923, Munich 2003), and Werner Maser prints a facsimile of one page of that list in his book, Sturm auf die Republik. Frühgeschichte der NSDAP (he gives as the source of his image the German Federal Archives, file NS 26/230). But this is different. I circumspectly send an image of part of the document to my expert friends for their view. MY HEAD is buzzing. I have high blood pressure and there is a lot of trouble from the freshly damaged repair site. I take it until Jessica comes home early from school then, crumpling under her nagging, at four o'clock I finally phone the hospital, and they tell me to come out there right away and bring an overnight bag. I pile into a very cramped Kew Cars taxi, driven by an Asian, for the long drive to Wexham. The medic diagnoses that I have torn a muscle and that it is bleeding profusely internally. So: stop the anti-coagulants. I stock up with codeine tablets again. Mr Gian Singer the consultant will see me tomorrow at eight a.m. I GIVE Gian Singer a copy of The Secret Diaries of Hitler's Doctor. He is flattered and asks me to autograph it. He confirms yesterday's diagnosis. Not much we can do, as the huge swelling is already subsiding. Cab back to Kew where I hit the sack again. Up around midday, feeling nauseous from the painkillers. Grrr. Supporter Mark -- writes: "£500 in the post." I reply: "Very kind of you indeed Mark. Come and have a meal when you are around here one day or one Sunday we will drive you out to Dorney for Sunday lunch." 1) Do you believe all historians attempt to persuade their audiences ? 2) What do you believe the role of a historian is ? 1) Do you believe all historians attempt to persuade their audiences? ANSWER: They differ. Some are so turgid and boring (Prof Richard J "Skunky" Evans, right, comes to mind) that they are incapable of swaying anybody. Most historians are by nature timorous beasts: they have been taught by historians, who have been taught by historians: they are incapable of thinking outside the box. The best historians (no names) are those who have stumbled into historiography from some other trade, and use the commonsense tools they learned there on this new pursuit. That is when they start coming up with unexpected answers, if they keep their chalkboard clean - i.e., if they start investigating with literally no preconceived notions. Then they face the dilemma: keep their jobs, and make money; or write Real History? The two are usually incompatible. Get back to me if you want more. 2) What do you believe the role of a historian is? ANSWER: "What is Past is Prologue." That is inscribed above the portals of the National Archives in Pennsylvania Avenue, Washington, DC. History is there, behind those doors, and behind doors like them, for us to learn from. Some historians are fearless, and do a good job. Pat Buchanan is one, with his recent book The Unnecessary War. Wars kill millions, often in hideous ways. They are too serious to lie about. All humanity cries out for us historians to find out and write only the truth, regardless of where the money is. History teaches us that political leaders often start out with the best intentions, but that they as often become corrupted by power and the belief that they have a Messianic mission, that they are themselves the Law, that they are part of History. It's for us historians to chop them down to size and show them for what they are. Get back to me if you want more. I halt there. "Nicole," I write, "that's all you get unless you phone and whine or flirt outrageously. At present I am in an 'I hate Australia' mode. Thanks for writing." I reach for the painkillers. . . Feeling very under the weather today. Trying to sleep off the nausea. I DREAMED at one point that I was walking without a limp -- it looked like a back-street in 1960s Málaga. It was so convincing, yet I knew it was not true.I was going to wake up and it would still be there. Sorry to have been silent for a few days. I had to go back in twice for the consultant to see it. . . It would be just unthinkable to have gone through this without the use of your apartment, and you have soared to the No.1 pole position on my "friends" list. Tell that to your sister. "Stuff that in your pipe and smoke it". HIMMLER: Yes Erika Lorenz was his principal secretary. I've read one or two of her interrogations, not very revealing. Alvensleben was his adjutant. That is a nice story about Prague, and I shall use it. Now you are on the right track. -- The 1936 speech was important too. MORE tumultuous dreams all night, and toward morning . . . another "my limp has gone" dream. How that leg and the discomfort have blighted the last six years, ever since the Vienna prison! I blame it too for Jae moving on: forever chasing after rainbows, she has found a much better guy, no limp, more money; and the steady pain must have made me more grouchy most of the time. Weight this morning 106.5, a new "low" (aided by Jessica not having brought any supper home last night for us). An Atlantan has offered to help Mrs. D with the bookstore. I pass his name to her. "He is one of us, has organised for me in the past, and will be very useful." She asks: "Did you tell him I am a disaster?" I reassure her: "In six months' time you will be as good as the 'Little Angel' was [her pet name for her predecessor] - at almost everything, and there are things that nobody will ever beat her at." Running MAGIC, for example, as we called it. THE other experts I have approached agree with me on the authenticity of the Hitler List. I wonder if the owner will now sit on it. That happens sometimes. I would have passed the link on to the German Federal Archives, but their Dr Lenz informed me before Vienna that the German Government had ordered the archives to have no further contact with me, even when it came to acquiring such missing troves of documents. As Der Spiegel pointed out, that was in violation of their own charter which obliges the Bundesarchiv to retrieve such stolen files. He explains, "We'll have to see whether it's a good idea. At any rate the three months deadline runs out today so I have faxed the file this very morning to the D.A. in Frankfurt." It has to be said that this is one lawyer who is on the ball the whole time. Single-handed, he is changing my jejeune perception of the legal profession. I have done some work on Himmler again today, thank goodness; written some good usable stuff. I get in a very good day's work on Himmler, untangling the 1931/1932 logjam nicely. I force myself to walk a mile to the post office and back, but return heavy laden with food shopping which was, uh, a mistake. I inform my new "Aryan" assistant in Key West: "I do NOT want to be in England when the Olympic Games are on. I am thinking, start the USA tour mid May, finish mid July and fly back to the UK from Washington DC. I will start making a firm itinerary in a day or two."
. JESSICA has found a ten pound note lying outside the front door. Anybody else would have pocketed it. Being Jessica, she prints a notice and tapes it to the door inviting anybody who has lost it to apply at our apartment. She'll never make a politician with those kind of morals. Bed around 10 p.m.
Trina writes to warn me that somebody is selling my books on the Internet: "It isn't your website, so I don't believe it would be an authorized site." I thank her: "The owner is Jaenelle Antas, who is or was a very good friend of mine, and we hope to regularise that shortly. I bear her no ill feelings!" I write to John Jae, "I have resumed writing, though uncomfortable still. In a day or two I will send you the next chapter of Himmler, where I got stuck in a traffic jam over [--] for four months. Amidst much honking and road-rage, the jam has begun to move again." From Australia comes this letter from a stranger who has read my first two books, The Destruction of Dresden and The Mare's Nest about the V-weapons. My Father, from Moscow, was an officer in General Vlasov's ill-fated Russian Liberation Army and was in hospital on the outskirts of Dresden when the city was firebombed. He only mentioned that after reading Kurt Vonnegut's "Slaughterhouse Five" and refused to discuss it further. My Mother and Grandmother were taken by the Germans from Byelorussia to work in a factory in Berlin. After Berlin had been bombed, my Mother heard "on the grapevine" that there was a heavy demand for workers at an unnamed site, but far enough from the capital, to be safe from Allied bombing. She recalled going there by train with her mother. All the other passengers were German military staff who regarded them with distaste and suspicion. Finally an officer explained that they were going to work at a top secret facility, Nordhausen. They were presumably housed at Camp "Dora", which was bombed severely on at least two occasions by the Americans, who then flew low to strafe the survivors, knowing full well that they were shooting at helpless slave laborers and not Nazi military personnel. Thank you for not only providing "forensic history", but making it riveting reading. I thank him for that lovely letter: "It is fifty years since I wrote those two books, and I still get lots of mail about them. Your mother and father were both very lucky to have survived!" I cook a couple of fillet steaks for Jessica and myself, with a creamy pepper sauce. It meets her approval. Rather worrying news from Paloma about . . . Madrid closes the day. I shall have to interrogate her closely when she comes. From my readings I have come to believe that the Germans initially wanted only to expel the Jews from Germany for reasons stemming from events in WWI, making it Judenrein, extermination was never a goal. Can you quickly comment on how it might have gone from that expulsion to Hitler apparently wanting to take over Europe and Africa? Why did he not stop after Austria, Czechoslovakia, and Memelland? I answer: "In short: There is a German proverb, one's appetite grows with eating."